With only 300 students enrolled — down from a peak of over 2,000 — it became untenable to sustain two separate facilities. The SF Weekly’s exposé last year about the institution’s â€œburnt chefsâ€ is old news. For years already, chefs and kitchen managers (myself included) had banned CCA interns from our kitchens because of their abysmal lack of skills. Still, few of us expected to hear that the grand Polk Street location would be abandoned in favor of the Potrero Hill’s cold, unwelcoming space. Going out in style, the academy hosted a multi-course buffet representing the culinary trends of each decade since their Polk Street kitchens opened. We moved from Salmon Coulibiac to blackened fish, through gooey macaroni and cheese to the â€œmo-gaâ€ of present fascination (molecular gastronomy, the woman in front of me in line explained). My husband, gesturing toward one particularly complex and well-executed ballontine, asked me â€œIs that a turducken?â€ Even I, with my 12-inch, dimpled-blade slicing knife that I haven’t used since my final garde manger class in 1996, had to laugh. 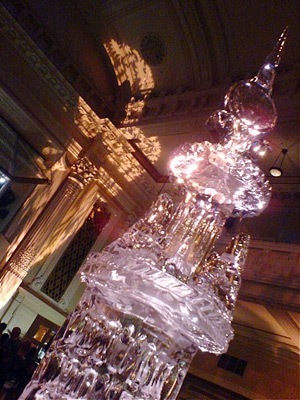 There were the usual glistening ice sculpture, two red-meat carving stations, and the ever popular and elaborate dessert table. Standing before the deeply sculpted, soaring columns of the main dining room, current CCA president, Jennifer White, tried to put a positive spin on the evening. She reminded us that the heart and spirit of the school resides not in the building but rather in those gathered in the room. The indomitable Chef Hervé Le Biavant, former executive chef (booted out a couple of years ago by the same administrators responsible for the academy’s overeager expansion) returned for the evening. Several of us didn’t recognize him at first, as he was wearing decidedly civilian clothes rather than his usual spotless whites, but seeing him helped stoke the nostalgic embers. Every alum has a Chef Hervé story. Mine involves a fingertip cut off in butchery class, and his assurance, in his surprisingly un-gruff school nurse role, that I didn’t need to go to the emergency room. He wrapped an extra Band-aid then a finger cot around my forefinger, advised me to be more careful when scraping around chicken bones with a flexible blade, and then told me to get back to class. Amazingly, my fingertip grew back, though there’s a bit of a dent in the nail to remind me of my deboning lesson: a fancy knife is only as good as the person who uses it. Their new restaurant, CarÃªme 350, opens on Wednesday, May 28. For their launch, they’ll be serving a special lunch and dinner menu on June 5th: 3 1/2 courses for $3.50. Not sure what half a course is, but if anyone can deliver half of what’s expected, the CCA certainly can.